Desserts are the highlight of any meal. Or at least they are when you have a sweet tooth! The trouble is, if you are watching the calories or trying to cut back on sweet things, a dessert is often off the menu. But you don’t need to forget about dessert if you try one of these super healthy dessert options. And the best bit? They taste just as good as they look! First of all, I wanted to apologize again for falling off of the grid. My passion for food has not gone away, though I have had to make a few adjustments in my diet which I will get to shortly. Mostly, it’s been a time issue, but it’s been a bit more than that. Without going into gory details, let’s just say my cholesterol, blood pressure and weight have been far less than ideal and my doctors suggested some changes to not only help with those issues but to help with my lower back disc issues. So I did something I thought I may never do–I saw a nutritionist. Granted, I know a lot about food and maybe you do too. But you can always learn more about anything and you certainly should do that when it comes to food. I thought that overall my diet was not horrible, until I started a diary and recognized that while I’m currently not drinking alcohol and mostly stick to coffee and carbonated water/seltzer, I was compensating by eating tons of empty calories. And even when I thought a light lunch of a baked potato and tomato soup was good, little did I know that it was a double whammy of bad–because of the carbs in the potato coupled with the sugar in the soup (more carbs)….but the thing my nutritionist pointed out about this lunch made a light bulb go off in my head. “You’re not eating enough protein,” she said. That lunch had zero protein (or maybe a negligent amount), and because of that it explained why I was often hungry an hour later. When she started to plot out some good choices for me, it started to make sense. Would you consider a breakfast of cottage cheese and fruit, two slices of whole wheat toast each with a tablespoon of peanut butter, and a small glass of tomato juice part of a “diet?” Trust me, it’s not. That breakfast is filling as hell. Which of course means no mid morning blood sugar spike leading to pretzel or doughnut gorging. The plan is now to have 30 grams (or more) of protein AND up to 45 grams of carbs, with some vegetables–at breakfast, lunch and dinner. And to have 7-14 grams of protein plus 15 grams of carbs as a snack (example apple and cheese or greek yogurt and nuts or an orange and some jerky). The magic words I heard are that I CAN have carbs. I’m also allowed to have one treat per day–ice cream after dinner or cookies or jelly beans. If I have the treat during the day, I have no treat after dinner. It’s a fair trade and way of deal-making with myself. Look, I know you don’t come here for health and nutrition advice. But I think it’s important enough that you should consider looking at your own eating habits, especially if you need to lose a few pounds (oh yeah, I lost 3 pounds this past week and I’m just starting) and are getting up there in age. So I’ll offer hints and suggestions where I can, starting with my breakfast this morning–Maple Bacon Walnut Oatmeal. Yes, I’m serious. I told my wife the other day that I had a single serving of oatmeal (I like to make it from scratch, which only takes 10 minutes or so), with walnuts and maple syrup, and bacon on the side. She suggested taking it one step further and crumbling bacon on the oatmeal. That’s one of the many reasons I married her–she is simply brilliant (and hilarious, I may add). So I tried that this morning. I made the oats the same way (with a splash of half and half too) and crumbled two slices of bacon on top. As good as it sounds, this particular version was not a home run. The bacon was overpowering because it was all on top. 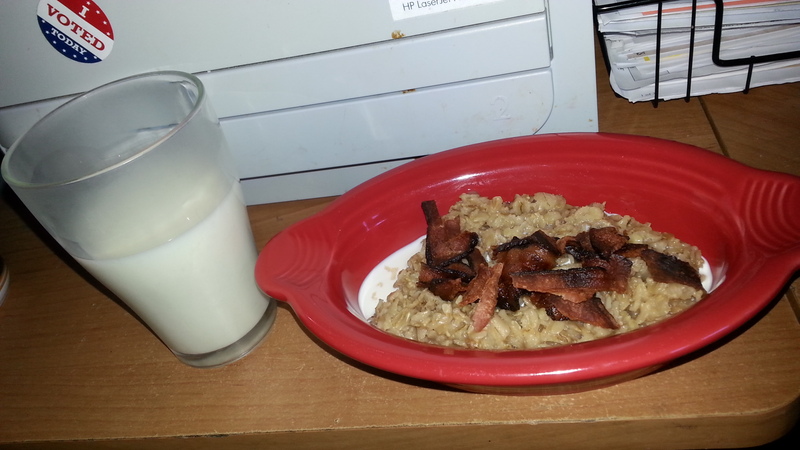 But as I got deeper and had more spoonfuls of oats with bacon accents, it was, then, a home run. A touchdown. A three-pointer at the buzzer. You get the idea, sports fans. I also need to try this with bacon that crumbles better without burning quickly as I used today. You’ll notice that frosty glass of milk on the side. I have always had milk with my oatmeal, and now even more so since I need that extra protein to balance the carbs in the oats. But I like to also put the milk in the freezer before I cook the oats, making it ice cold in a frosty glass. It’s the little things, I tell you. I made a couple of tasty and healthy dishes this past weekend that I wanted to share with you all. First, since we had two pints of sungold cherry tomatoes from our CSA, as well as a wealth of basil, I had an idea. I heated some olive oil in a large nonstick skillet over medium heat, threw in a handful of the sungolds, shook the pan a few times and let them roast for a minute or two. Then I scrambled 3-4 eggs with salt and pepper and poured those into the pan. 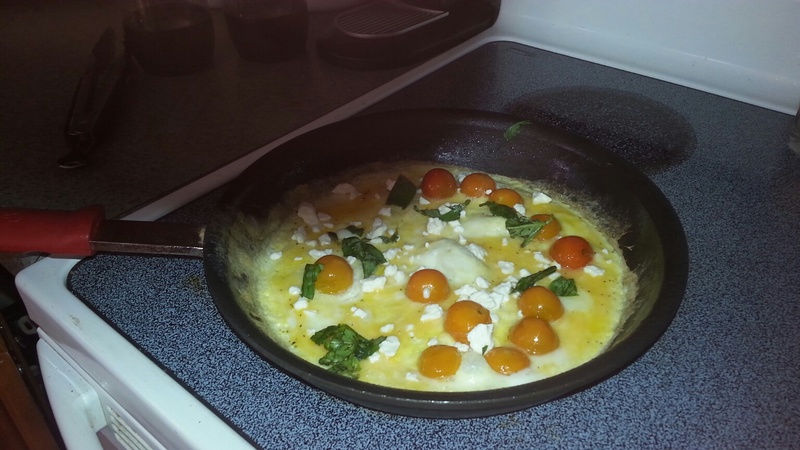 I swirled the pan around a bit and once the eggs were just about set, threw in a couple tablespoons of feta cheese, and a sprinkling of chopped basil. I cooked for another 30 seconds or so and then transferred to a plate, cutting the omelet into two servings (you can also use more eggs and cut into four wedges). The other thing I had a taste for was fried rice. I like to make mine with pork, but it’s always difficult or next to impossible to make the kind of red-tinged barbecued pork you see in Chinese restaurants. So I did the sensible thing and picked up a container of roast pork at our local Chinese takeout joint. They call it “boneless spare ribs,” but it’s basically strips of barbecued roast pork (and it’s freaking delicious). 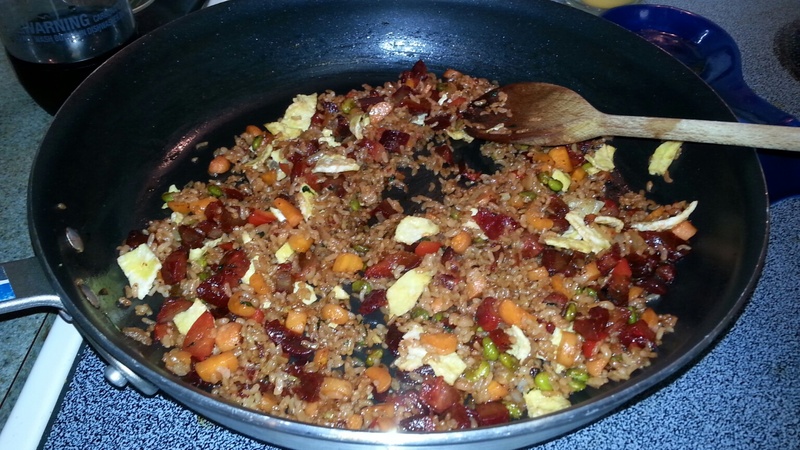 So here is how I made my fried rice–I took a bag of frozen bag brown rice from Trader Joe’s (this is the best tasting quick brown rice you will find anywhere–I guarantee it), nuked it for three minutes and set the bag aside. I heated a couple tablespoons of canola oil in a large nonstick skillet with a splash of sesame oil. I threw in some finely chopped onion, carrots, sweet pepper, shelled edamame, and a small bit of minced fresh ginger — and stir fried that for 3-4 minutes. Then I dumped in the cooked rice and maybe 1/2 cup of diced roast pork and stir fried for another minute. Then I added a few sprinkles of Kosher salt, some shakes of black pepper; and a sprinkling each of teriyaki sauce, soy sauce, and Korean barbecue sauce, stirring for about a minute. Meanwhile, at about the same time I added the sauces, I heated a small nonstick skillet sprayed with cooking spray, and dumped in one scrambled egg. Instead of stirring, I just let that set, and slid onto a plate, cutting into small pieces and adding to the fried rice, stirring another 30 seconds and then sprinkling with chopped cilantro. After dividing among two plates, I sprinkled mine with a few drizzles of chili oil. You can make this rice with whatever you have on hand. Green onions are typical but I don’t like them and they don’t like me. You can also use peas, corn, bok choy or whatever you can find. It’s fun to try different combinations, but trust me — the pork is what makes it. My wife says it’s better than takeout, and who am I to disagree? So maybe you should try it and see if you like it too. But I already know you will. Greetings everyone….I am still here, so keep checking back often and I’ll have many updates to follow about recipes, food shows, product reviews and more. I mean, it’s almost football season…..well, it kind of IS already, so I’m getting my indoor smoker ready and also wanting to check out a recipe I saw recently for wings–in which you steam them first, then pan fry them before tossing with wing sauce. It’s an alternative to deep frying that I think would be cool to check out. 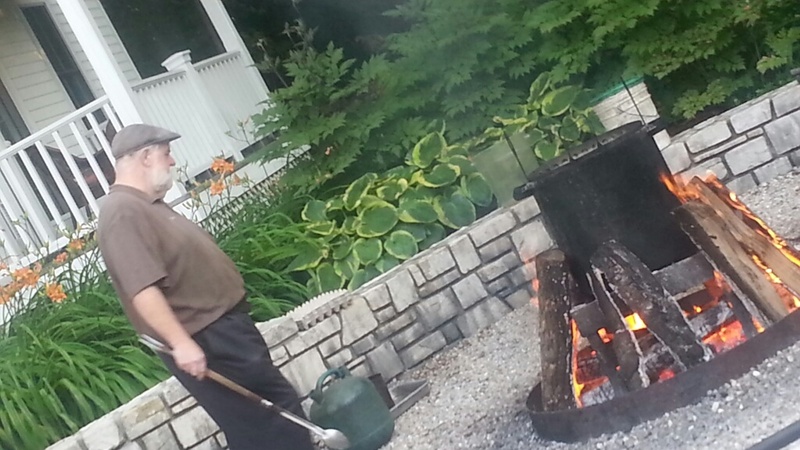 The other thing I wanted to bring up and mention is the fish boil my wife and I went to when on vacation recently in Fish Creek (ha), which is up in Door County, Wisconsin. We stayed at a renowned bed and breakfast called the White Gull Inn and one of their claims to fame is their Wisconsin fish boil, something that is a tradition year-round in that part of the country. Now, I’m not a huge seafood eater. In fact, only recently have I ventured beyond occasional shrimp or crab and made actual fish. But honestly, I’m still squeamish about cooking it, afraid I’m going to screw it up, like the time I made cod that became shredded fish on a plate. So keep in mind this is not fried fish. What they do is have these master fish boilers, or whatever they call them. These guys dump buckets of large pieces of fish–skin, bones and all–into a vat of boiling water over a fire. After a few minutes, they dump kerosene on the fire and it shoots flames up to the sky, but what it also does is push all of the fish oil up and over the side of the vat–leaving you with tender, flaky whitefish that can easily pull from the skin and bones. They serve it with a delicious horseradish sauce, boiled potatoes, slaw and bread. And it is delicious and not at all fishy tasting. If you are not sure about seafood, this is one meal I’d recommend trying if you are somewhere that they do this. And honestly, the one thing I didn’t like about this meal was the slaw–for the life of me, I don’t get why anyone puts raw onions in cole slaw. It makes it so that all you taste is mayo and onions. Blech. Don’t onion the slaw, is what I always say. Oh yeah. that photo says it all, doesn’t it? It’s prime time for corn. I guess, as the farmers call it, it’s sweet corn….if you just say “corn on the cob,” you also mean corn that is used for feed for pigs and cows on farms. 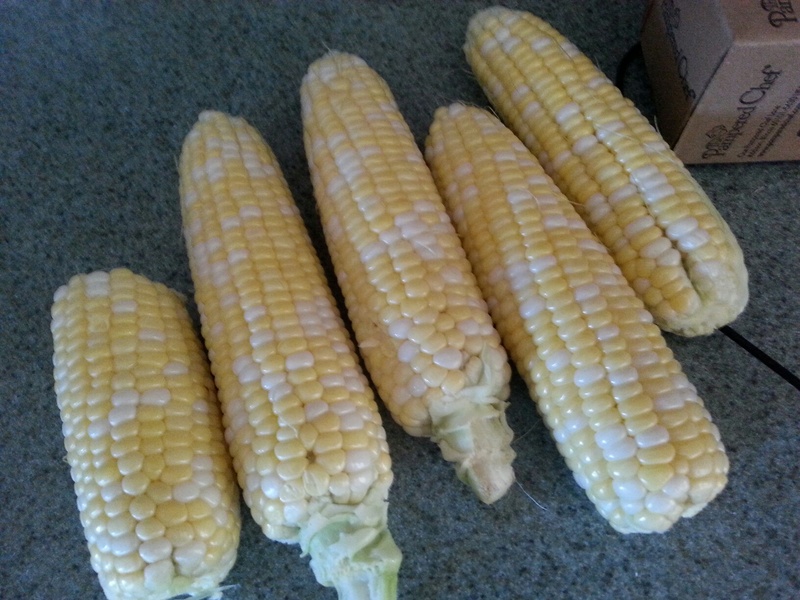 Where I live in Wisconsin, sweet corn is available from local farms from late July until early September or so. The first crop is super sweet and tender, and as the season wears on, the kernels get bigger and thicker and more dense, and less sweet and less tender. But for now, it’s prime time for corn and that means we eat it in our house pretty much every day for six or so weeks. There is no good reason not to! If you love hearty recipes, then check out this excellent series of recipes for men.